This organic Beaujolais from the village of Chiroubles is packed full of warm summer fruit flavours. Ready to enjoy now, its supple, silky tannins will also enable it to develop gracefully over the next year. Wine of France. Suitable for vegetarians. 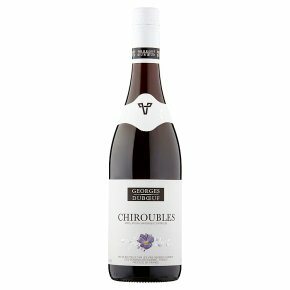 Georges Duboeuf Sélection Chiroubles is typically the most delicate and elegant of all the Beujolais cru. On the nose, classic aromas of peonies, violets and red fruit. Fresh and lively with soft fruit flavours, this wine is at its best served slightly cool at 12°C. Ideal to drink in its own, or a great match with cold ham, charcuterie, barbecued meats and roast chicken.